High school athletics and the injuries associated with each sport. With the school year well under way, and Thanksgiving on the horizon, many fall athletes are winding down their seasons while winter athletes prepare to gear up for theirs. But as student athletes take the field, some parents worry about potential injuries to their children. Fear not. While students are at play, researchers are gathering data in the hopes of preventing the injuries that can shorten a young athlete's season. And while injuries do occur, the risks of playing sports may be far outweighed by the risks of not playing them. "We never want any of our injury research to scare any parent into pulling their kid out of sports," said epidemiologist Dawn Comstock, a principal investigator at the Center for Injury Research and Policy at Nationwide Children's Hospital in Columbus, Ohio. "The long-term negative health risks associated with an inactive lifestyle are much more serious than the potential of sports-related injury." She also noted that the vast majority of sports-related injuries are minor. "We actually want to see more kids play sports and be physically active more often. We just want to keep them as safe as possible while they're out there." For those who want to learn more about the injury rates and risks, as well as some ways researchers, coaches and the athletes themselves are trying to prevent them, we present 11 injury-prone high school sports. Unsurprisingly, football leads a number of safety studies as the most dangerous sport. Frederick O. Mueller of the department of exercise and sport science at the University of North Carolina does a long-term survey of catastrophic injuries in sports. His study puts football as the most dangerous in terms of total catastrophic injuries, with 603 -- and 101 of them fatal -- since 1982. 1990 was the only year in the study without a fatality. "When you just look at the numbers, football has the most catastrophic injuries," Mueller said. His data, however, look strictly at catastrophic injuries -- those resulting in very serious injury or long-term disability. Comstock's data, which tallies every time an injury causes an athlete to miss at least a day of practice or competition, shows football as having a little over 12 injuries per 1,000 players. But football is also the nation's most popular sport for high school students. From the 1982-83 school year through the 2005-06 school year, over 34 million boys and over 16,000 girls played the game. Over 1 million students play each year. While the numbers are higher than other sports, the rates are actually lower than sports like ice hockey and gymnastics. Reduced rates of injury have come through rule changes and improvement of equipment, but Mueller thinks they can be lowered even more through better coaching. "I think so many football injuries can be prevented if you teach the proper fundamentals of blocking and tackling," he said. "The big thing is, teaching the kids not to hit with their heads." And the mindset of players also might need some changes to keep young players from getting injured. "The mindset in football is that you play injured and you don't complain to the coach that you're hurting," Mueller said. This can especially put a player at risk after suffering a concussion, where a second injury before recovering from the first can lead to long-term damage. "I think it's important for coaches to realize that and to let their players know that they can come to them," Mueller said. 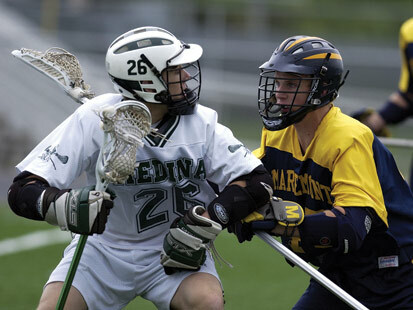 Lacrosse is the fastest-growing high school sport in the nation, with roughly 144,000 participants in the 2007-08 school year, according to NFHS. But that kind of growth can present its own problems. When a sport grows quickly, many new coaches may not have adequate training -- a situation some worry may lead to injuries. "It's a concern among the governing body, that it is growing so quickly," said Andrew Lincoln, director of orthopedic and sports health research for MedStar Research Institute. Lincoln also serves on U.S. Lacrosse's sports, science and safety committee. In conjunction with Union Memorial Hospital, Lincoln and other researchers are seeking to find out the causes of lacrosse injuries and reduce them. "There's a lot of concern about whether or not the game is getting rougher, more aggressive, so we're focusing a lot of our research efforts on what's going on with concussions, what the mechanisms are," said Lincoln, noting that concussions were the most common injury for boys (but only fifth for girls). They videotaped 500 high school lacrosse games in Fairfax County, Va., this past spring, and hope to present their preliminary results by the start of the next season. One possible recommendation they might make is introducing a youth ball -- less dense than the one used at the collegiate and professional levels. While the sports are similar, the most common injuries in softball and baseball are quite different. In baseball, "I would say the most common is with pitchers and arm injuries, whether that be shoulder, elbow, or just regular tendonitis," said Jared Voss, head coach of the baseball team at Joliet Catholic Academy, in Joliet, Ill. But while high school baseball pitchers have pitch counts and need to take days of rest in between starts, Kendall Ryndak, the 15-year-old sophomore starting pitcher at Downers Grove North High School in Downers Grove, Ill., pitches nearly all of her team's games. "I know that I do pitch a lot and it can have a long-term negative effect on my arm," she said, but added "my arm is pretty healthy and I haven't had any injuries with my arm." Ryndak said she had suffered a sprained ankle, but her arm has been fine despite playing softball year round since age 9. Major differences for baseball and softball pitchers include underhand pitching in softball, versus overhand in baseball, and the distance from the mound to home plate -- 60 feet, 6 inches in baseball, but only 40 for softball. 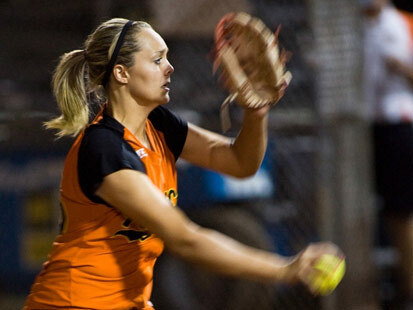 As Ryndak's coach, Mark Margo noted, the more natural motion of underhand pitching has allowed her to pitch three games in a day, while when he was a baseball pitcher, he needed days off in between pitching outings. He said he monitors Ryndak much more closely when she is in the outfield and needs to throw overhand. Also, he said, when it comes to throwing overhand, he has his fielders drill at shorter distances at the start of the season to build arm strength. Margo feels the mound needs to be moved away from the plate, both to avoid dominant pitching, (no-hitters are a regular occurrence in softball, unlike baseball) but also to avoid a common softball injury -- balls hitting players, especially pitchers, before the players have time to react. "I think that's the most dangerous injury that's going on right now," he said, noting that many pitchers and fielders now wear special masks to protect themselves. He said two years ago, his pitcher was hit seven times during the season. Voss noted that much of keeping his pitchers injury free involves common sense. "I personally, in high school, I try to promote guys doing other sports," he said, noting that it helps avoid burnout in players who play the same sport year-round. Also, he said, parents and coaches need to be aware of an athlete's limits, and keep them from overusing their arms. "Sometimes as coaches our ego gets the best of us," he said, adding that coaches need to take their star pitcher out of the game--no matter the circumstances--when they have pitched too much. Unlike the other activities on this list, cheerleading is not a sport. Or at least, it's often not classified as a sport, and that may be part of the reason why its injury rate is so high. The NFHS does have a listing for "competitive spirit squads" on its participation numbers, but what a cheerleading squad consists of can vary greatly--and that can effect the likelihood of a participant being injured. 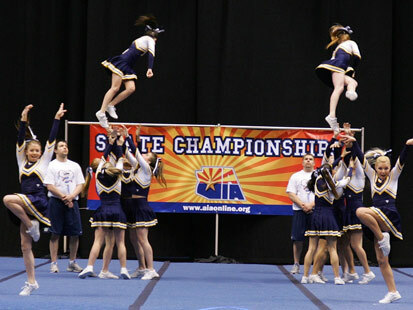 "At the high school level, cheerleading is a very varied event," said Comstock. She noted that in some high schools, the cheerleaders serve as a pep squad, while in others they do the same flips and jumps one might expect in a gymnastics routine. But while gymnasts may do their acrobatics on a mat, "[cheereladers] frequently perform those types of activities in settings that place them at higher risk than gymnasts," said Comstock. Additionally, while gymnastics is a solo event, cheerleading has more than one person involved. "You also have the possibility of person to person contact," said Comstock. "The vast majority of high school sports-related injuries occur in player to player contact." Kim England, founder of Energized Athletics, agrees that cheerleading is a team sport where more than one person is involved. "The hardest thing about cheerleading is that they're needed for every piece for that routine," said England, as opposed to other sports where another player from the bench is ready to replace someone who's injured. In cheerleading, when an athlete gets a sprained finger or hurt in some other way, there isn't anyone readily available to take over their position, and so when that happens, a routine may be unperformable until the team member recovers. England's daughter, Samantha England, has been cheerleading for about 10 years and cheers and coaches for Energized Athletics, as well as cheering for Watertown High School. She has suffered a cyst in her wrist as a result of over-tumbling, as well as floating knee caps. Samantha has seen her fellow cheerleaders endure the occasional sprained wrist which also occurs due to over-tumbling. However, she insisted that the occurence of injuries during a group stunt is minimized through a group effort. "If we're doing a stunt, the girl [who's thrown in the air] is caught before she hits the mat," said Samatha. "The basers always catch her." To prevent injuries from appearing on their team, Dwayne Harmon, all-star director of the Energized All-Star cheerleading team, said that he uses proper progression to teach the girls and boys on his squad. According to Harmon, proper progression involves "teaching the basic fundamentals" before having the cheerleaders try out complicated tricks and stunts. Also, the skill level of a cheerleader has bearing on the type of injuries they get. "The higher level of skill [of a cheerleader], the more risk that comes in," said Dannie Halloran, cheerleader for Energized Athletics ad cheerleading coach for Cambridge Ringe and Latin High School in Cambridge, Mass. For that reason, Mueller believes that better regulation could make the sport safer. "If you look at cheerleading, [the injuries] probably can be reduced," he said. Despite the high injury rate in cheerleading, Kim England believes the benefits heavily outweigh the risks. "I got Samantha to cheer for academic reasons, since you need certain grades to continue cheering," England noted. "It's great for fitness [and] keeps her out of trouble. [Also], just to see the bonding and how excited [the cheerleaders] are is amazing." Halloran agrees with England on the benefits of cheerleading. "It's an amazing sport to get into," added Halloran. "Not only are you learning great discipline on a mat, putting a routine, but it's a great sport of socialization where you meet great people with the same ambition and get to work on the same goals." The injuries that plagued the U.S. Mens' and Womens' Gymnastics teams during the 2008 Olympic Games in Beijing were a clear indication that the sport of gymnastics poses serious strains on the human body. At the high school level, the risk is no different. In fact, those only involved in gymnastics at their high schools, as opposed to also being part of a club, put themselves at greater risk for injury. According to Mary Bakke, a national gymnastics judge for USA Gymnastics and the national technical chair for United States Association of Independent Gymnastics Clubs, Inc., those involved in all-around clubs are better conditioned than high school gymnasts, who only compete in the sport for a season. 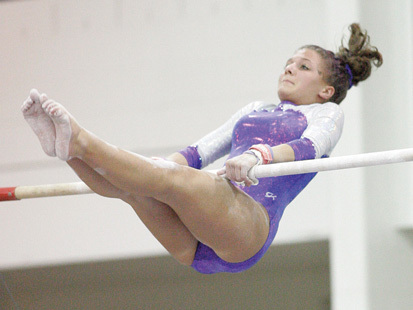 In comparison to club gymnasts, "high school gymnasts are out of shape," said Bakke. "[Having] a trained coach is important," she added. "[Sometimes] high school coaches don't know the sport," a fact that can put the athletes in harm's way. Injuries that are unique to gymnastics are knee and ankle injuries, as well as the occasional arm, hand, neck or back injury. "Floor exercising and vaulting are prone to injury," Bakke pointed out. "If the body is not in good alignment, the body is piked," which can lead to severe injury. Gymnasts are trained to minimize their own risk of injury through good conditioning of their bodies which includes maintaining good flexibility, muscle control and staying in good shape. Also, it is important for gymnasts to learn how to absorb the shock from their landings through techniques which include bending the knees upon landing rather than keep their legs straight. Bakke emphasizes that "things have to be broken down [by coaches] to lead up to certain skills" as well as having workouts tailored to a particular gymnast. The consequence of doing a trick cold turkey can include a permanent injury accompanied by chronic pain. At most gymnastics facilities and meets, there are athletic trainers who help condition the athletes, as well as a sports medicine trainer to help treat injuries. When a gymnast suffers minor pain or weakness on their joints, they are often asked to tape their ankle, knee or elbow to give it extra support. However, taping does have its limitations for a competing gymnast. "[When you] tape an ankle, your range of motion is limited," Bakke stated. "You can't point your toes." "You're gaining something, but giving something up as well." When Tonia Speicher came in to school, John McDonough, athletic director for Boston Latin School in Boston, Mass., thought she had messed up her eyeliner and mascara. It turned out that Speicher, a junior at Boston Latin School and midfielder for the girls' soccer team had developed two black eyes from an accident that occurred during one of her soccer games. "I was heading the ball [and] the other girl was also heading," Speicher recalled. "We were facing each other," which resulted in a nasty head collision between the two players. Speicher ended up getting what she described as "a giant egg on my forehead... which progressively turned into two black eyes" and damage to her nose. Racoon eyes were not the only casualty that Speicher had endured from being part of the soccer team. Over the summer, she had participated in summer-league soccer, where she sprained her ankle. Others on the Boston Latin School girls' soccer team also sustained sprained ankles. Two members sustained even more serious injuries; one had a torn anterior cruciate ligament (ACL), while the other suffered a medial collateral ligament (MCL) tear. Soccer injuries are not uncommon. According to The National High School Sports-Related Injury Surveillance Study for the 2007-2008 school year, a study released by National Federation of State High School Associations (NFHS), there were over 400 soccer injuries among all girls' soccer athletes, an injury rate of 2.35 per 1,000 athletes. Common injuries seen among athletes who play soccer include those that affect the ankles and shins, according to Bob Rausch, athletic trainer for St. John's High School in Shrewsbury, Mass. Rauch has also witnessed a soccer player getting a fractured collar bone during a game. The sophomore star got knocked down and landed on his shoulder. To prevent such injuries from happening, athletic trainers like Rausch help prepare these high school athletes through exercises which include strength-training in the school's own weight room. "The stronger [the athletes] are, the less prone to injury they are," said Rausch. As for treatment, there are several tools that high schools have to diminish the pain that accompanies a sports injury. Among these are a supply of ice and a whirlpool for hot-cold treatment, which has been proven to be an effective technique for treating injuries as well as muscle stimulation and ultrasounds. The results from such treatment are significant. "Discoloration [from bruises] is decreased," said Rausch. "And decreased swelling [is observed]." Played by both men and women, ice hockey may be the most dangerous high school sport. Ice hockey is played by significantly fewer students than play football, with over 36,500 men and just over 8,600 women playing the sport in 2007-08, according to the NFHS, but they were likely to be injured at a higher rate. In fact, the UNC study showed women suffering a serious injury at a rate three times higher than the rate for men, and both were tops for severe injuries in any sport. "Ice hockey and gymnastics had a higher rate than any of them," said Mueller. While this may surprise some, Comstock, who has begun studying the sport this year, attributes hockey's higher injury rate to the rink. "One of the differences in injury rates is the playing environment," she said. While both sports involve high-speed collisions, she said, surfaces can make all the difference. "In football, they're landing on a relatively soft surface compared to ice hockey," she said. Also, Comstock noted, the walls surrounding the rink are perhaps the greatest source of injury. "In ice hockey, so much of the contact ends with an athlete striking the boards and the glass," she said. Track and field injuries mostly occur in the field. Mueller notes that the most common injuries are in the pole vault and discus--typically when someone is not paying attention and is hit by a throw. "They shouldn't ever happen," he said. 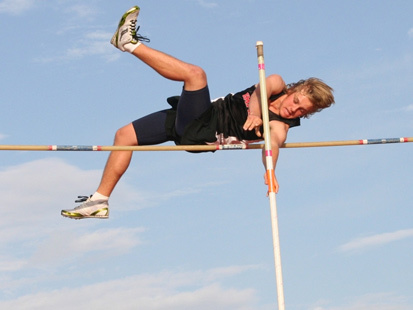 As for the pole vault, the injury rate has been lessened by promoting protective headgear that can be worn at the high school and college level. "Some of the track injuries have been prevented when they first started looking at pole vaulting injuries," said Mueller. A major injury that occurs in the track side of track and field is shin splints. According to John McDonough, athletic director for Boston Latin School in Boston, Mass., shin splints are common in track and field and cross country athletes. "A lot of younger, inexperienced runners join the team, and many have never run before," McDonough pointed out. "They wear the wrong footwear, don't know to stretch [before running], and just run with all their might," all reasons for the injuries that occur at the high school level. To prevent such injuries, several trainers note that it's important to stretch, as well as be well-conditioned. "Core stabilization helps prevent a lot of injuries," stated Dr. Tim Hosea, chairman of the sports medicine committee for the New Jersey State Interscholastic Athletic Association and associate professor at the Robert Wood Johnson Medical School. However, those who participate in endurance-type sports such as track and field and cross country running are less likely to be injured because many of the athletes are trained to endure long periods of pain in their sport, noted Hosea. "Those who participate in aerobic-based, lifelong sports -- those athletes tend to stay in shape later in life," Hosea said. 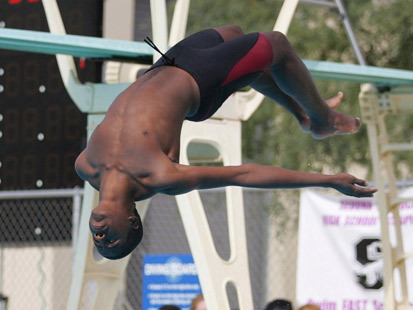 The sports of swimming and diving have their fair share of strains and injuries at the high school level. According to Jim Clover, coordinator at the S.P.O.R.T. Clinic in Riverside, Calif. And author of "Sports Medicine Essentials," both swimmers and divers primarily endure pain on their shoulders. One of the most severe shoulder injuries for swimmers is impingement. This occurs when the small muscle on top of the shoulder underneath the bone -- called the supraspinatus -- is affected. "When you raise your arms, it gets pinched [which is the result of] impingement syndrome," noted Clover. Another injury associated with swimming include thoracic outlet syndrome, an injury more common among female swimmers where an entire arm can change color due to lack of circulation to the arm. Divers have a different set of shoulder injuries to be concerned about due to the acrobatic jumps they must accomplish during practice and competitions. "[Divers] do a lot of upper body stuff," said Clover. Because of the many flips and jumps they do, "they need to be wary of their core stabilization," Clover stressed. The treatment for these injuries include the run-of-the-mill ice or ice massage right after swimming or diving as well as taping for joint support to increase circulation. Waiting until you get home may be too late, said Clover. One important preventative measure against injuries can be summarized in one catchy phrase. "Whatever you do in the front, do to the back," Clover said. This means that any core workouts you do to the front side of your body such as sit-ups, you must do to your back side to prevent strained muscles. Jumping for shots, blocking opponents at the basket and rushing for rebounds make the fast-paced game of high school basketball an arena for injuries. What Bob Rausch has seen in his seven years as an athletic trainer for St. John's High School includes many ankle injuries on basketball players, several of them caused by opponent players accidentally landing or rolling over their feet. David Hess, boys' basketball coach at Tuscola High School in Central Illinois, can attest to these ankle injuries. According to Hess, sprained ankles are often seen as well. He has also witnessed torn ligaments, jammed fingers and knee injuries caused by the many jumps basketball players do both in practice and in games. "I would say ankle [injuries] occur most in basketball [due to] contact with a lot of jumping," said Hess. To strengthen the ankles of his players, Hess emphasizes preparation through warm-ups and strength training. Through this, Hess said, "you're going to turn a four-week ankle sprain into a one-week ankle sprain," therefore ensuring fast recovery of a fallen player. Through building strength around key ligaments impacted by basketball, injuries are prevented or the seriousness of injuries are diminished, added Hess. For any injuries that occur in practice or during a game, athletic trainers are usually on the sidelines ready to treat any pain that strikes the basketball players. Taping ankles is one way to relieve the pain during important games. However, if "you're always taping, the ankle become dependent on the tape," said Hess. To prevent this, players strengthen their ankles and are trained to endure an ankle pain during practice. The constant thrusts and throws seen in high school wrestling would lead anyone to believe that wrestling is quite dangerous and prone to many injuries. However, many of the casualties suffered by high school wrestlers are not directly related to the sport itself, but to hygiene. As of late, MRSA bacterial infections among wrestling athletes have been a more common occurrence. According to Clover, these infections are 100 percent avoidable through good cleaning of the mats where wrestling battles take place. Another cleanliness-related infection that wrestlers get is ringworm, which is transferred either from the mats or from other wrestlers. And like the MRSA infection, ringworm is 100 percent preventable. The more physical ailments that wrestlers endure include cauliflower ear, which happens because of the repeated hits wrestlers' ears get. "It's the contusion of the ear, which causes it to swell," pointed out Clover. Fluids enter the ear as well, an occurrence that can simply be avoided by wearing head gear. In comparison to other sports, wrestling injuries are not as prevalent. The only major muscle injury that wrestlers need to be wary of is a specific shoulder ailment. According to Clover, because wrestlers are constantly yanking their shoulders, the capsule around the shoulder gets stretched out. But Clover stated there's a simple solution to the stretched capsule. By increasing and strengthening the muscles that surround the capsule, any potential injuries can be avoided. Nana Duffuor contributed to this report.